Saturday October 1st was the first official day of Halloween season. 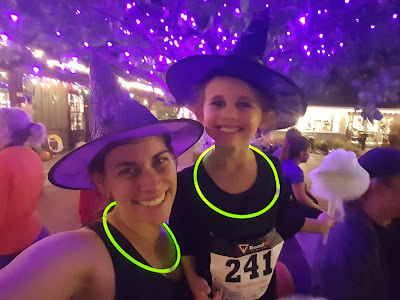 And what better way to ring in the socially accepted day to do Halloween activities than by running a witch themed 5K? Since my daughter wanted to run the race as well, we both signed up. The race was being held and put on by Gardner Village. Around this time of year, Gardner Village has a witch fest, where they decorate the entire place with life-sized witches doing all manner of activities. 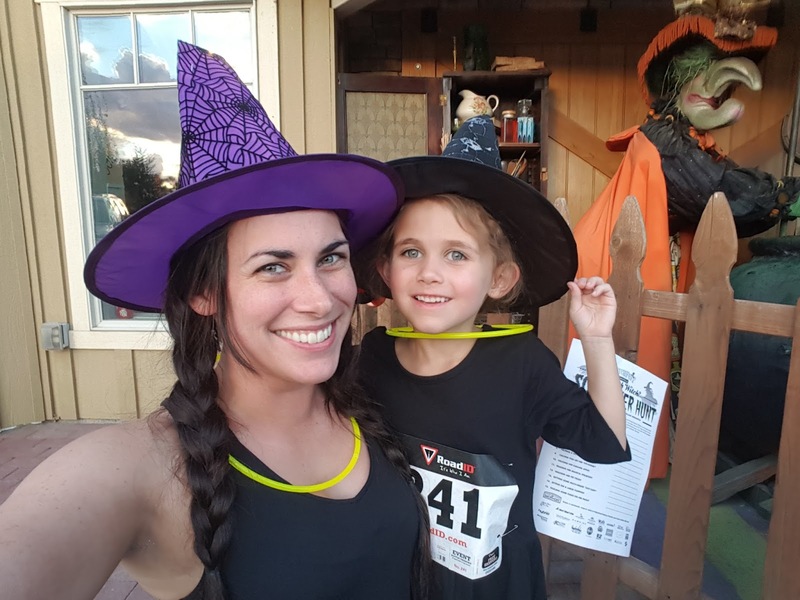 Along with the race, anyone can go down there during October and try to complete a witch scavenger hunt that will reward you with a free cookie. My friend Tobi and her kids joined us for this part. We walked all over Gardner Village and found ten witches! The kids loved running around to find the witches from the scavenger hunt list and matching them to the clues provided. We about had it done, but the Witch Run was about to start, so we decided we are going to try the scavenger hunt another time. 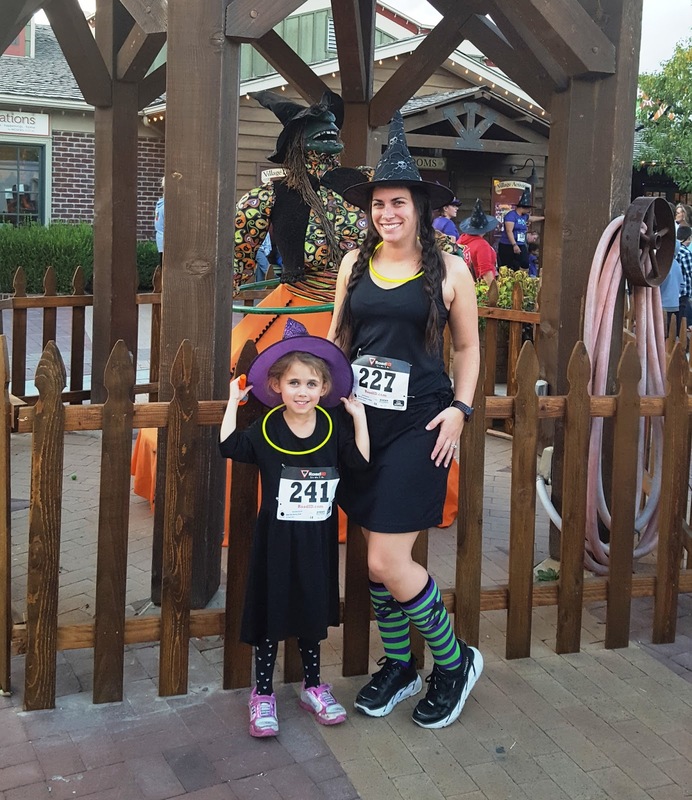 All witched-up for the race! June and I dressed up in running-friendly witch costumes. She picked out a plain black dress with her black and silver tights. 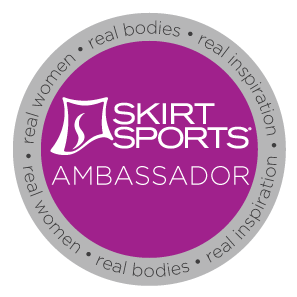 I wore my Skirt Sports black cabana dress with witch socks. 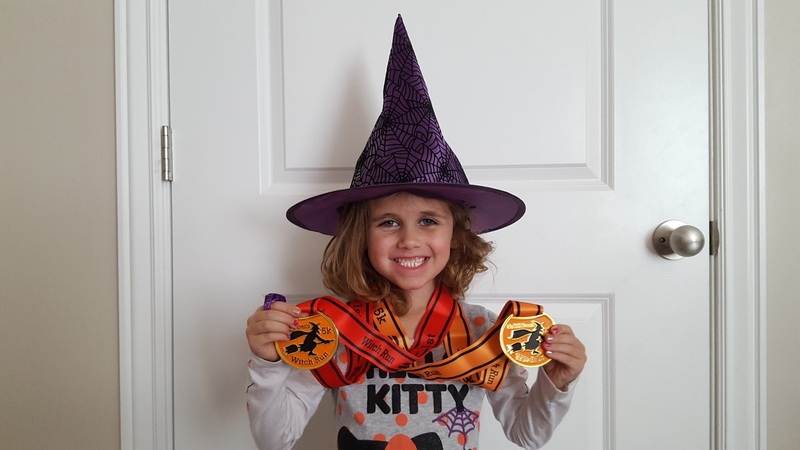 Our race registration, along with T-shirt and finisher medal, also included witch hats, which we wore with our get up. June wanted the black and silver hat to match her tights, so I wore a purple one with black spider webs. This is an evening run, starting at 8pm. 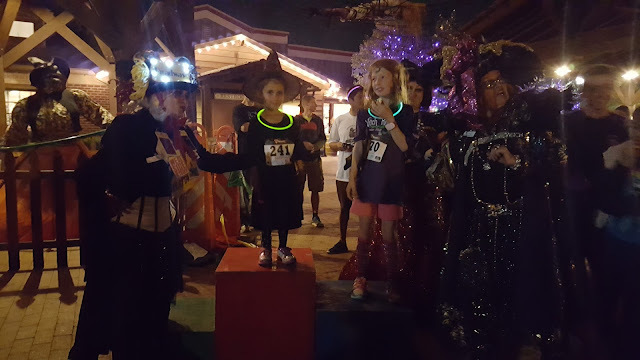 The opening ceremonies consisted of a lighting of the cauldron where three witches completed a short run passing a “lit” caldron to each other until they reached the starting line. The starting area was decorated with green, blue, and purple lights…and a big castle! I told June that she didn’t need to worry about winning or passing people. Instead, I wanted her to do her best, try her hardest, and have fun. I told her that the only way you win a race is by finishing it. So, to the tune of Monster Mash, we started the race. The website warned that it would be dark and to bring lights, but I thought there would be at least street lights, so all I brought was my phone. Well, it was dark. Dark enough where I tripped and fell, so I started being extra vigilant. I ran with June the whole way, and she was having such a blast! She wore a glow necklace and light-up shoes which lit up with every stride. She did a great job running! She ran most of the whole race. I let her set the pace, and made sure to point out cracks and dips and rocks and other tripping hazards. We took walking breaks when needed, but we ran quite a bit. This being a fun run, everyone seemed to be having a good time. There were a lot of kids on the course as well. Our hats kept blowing off in the wind, and with the speed of our running, so I ended up holding them for most of the race. I had June put her hat back on for the finish line though. We did end up passing quite a bit of people, since June was running at a decent pace. She picked up the speed when we saw the finish line, and crossed it victoriously with a time of 48:05, not bad for a five-year-old! The race witches even ran in with her and gave her high-fives. The finish line refreshments included Gatorade and water, as usual, but also a huge selection of Halloween candies, freshly brewed Root Beer, and even cotton candy! We stayed for the award ceremony, especially since they kept playing June’s favorite Halloween jams. They announced the age group winners, and June won first place for the five to nine year olds! She was so happy and so excited, and I was so proud of her! Her first first place finish! The Gardner Village witches put her up on the podium. It was dark, so the picture isn't so great. The medals weren’t shipped out in time by the medal company, so we still need to pick them up. But, the race is giving us a discount of a future race by Gardner Village. This race was so much fun that I will for sure be using that discount!